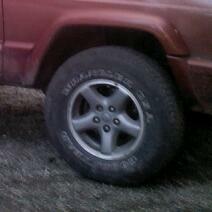 Got four 99 xj 5 spoke aluminum Rims. Good shape with 235 75 15 goodyear all terrains i believe. $125 obo. I can meet in auburn/Kent/puyallup or tacoma area. I Will post better pic later today. Will trade for jeep parts too. Need headliner for 90 xj with or. Without sun roof cutout. Taillight for 90 xj driverside. Bumper end caps for 97+ chillepepper red or black. Lower dash trim for 90 xj. Or offer up any aftermarket parts for trade. Last edited by MoparNJeep; 05-24-2013 at 03:53 PM. I have a pass side black bumper end cap off my 98 if you want it you can have it. Ill take it. I mangled my last trip out At elbe. Let me know when you want to run up here and Ill meet you at Sears/Commons on 320th and 99.